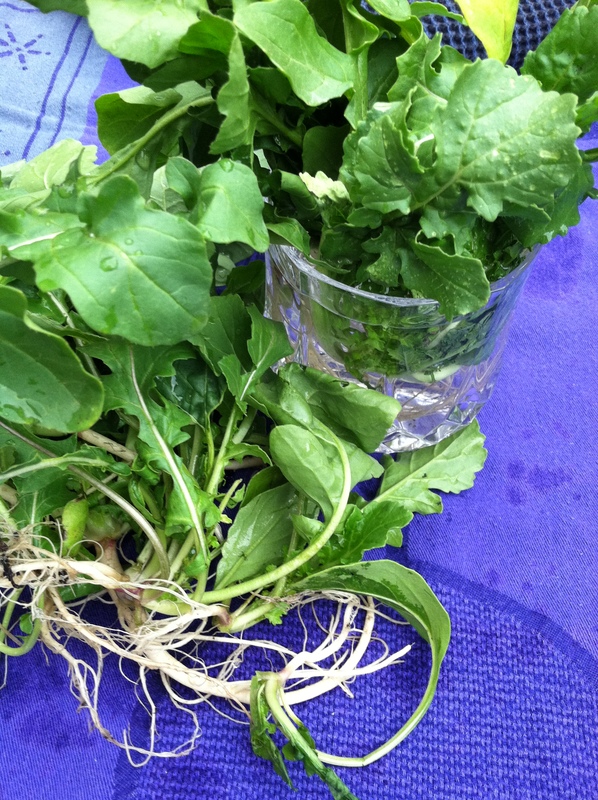 Today’s shared bounty is some lovely arugula (aka rocket). The added bonus of this shared bounty is roots! After washing what we would eat, I choose some to plant and grow more. Washed and refreshed, arugula is ready for a terrific, quick and easy salad from things created over the last few days for posts on Spoon Feast. Picking some fresh red-leaf lettuce from the garden, combining it with arugula, garnishing with fresh tomatoes, cucumbers, steamed artichokes, pickled beets and hard-boiled eggs. All food gathered from a walk to the farmers market Saturday and shared bounty from friends and colleagues. Oh, add salmon, wild caught, from Alaska. We tossed the salad with a chive blossom vinaigrette to bring it all together then added croutons and slabs of fresh bread and a few shavings of cheese. 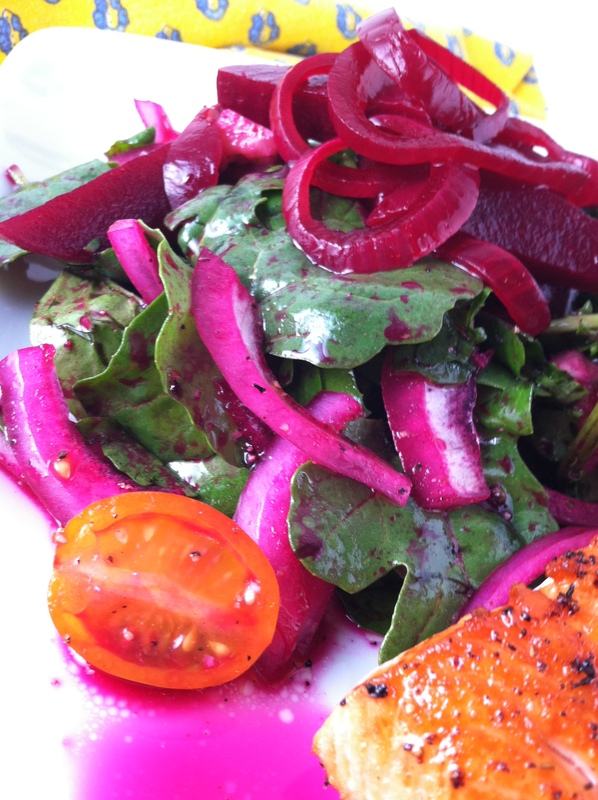 You could use the beet juice from the pickling jar and drizzle a bit of olive oil for the dressing. 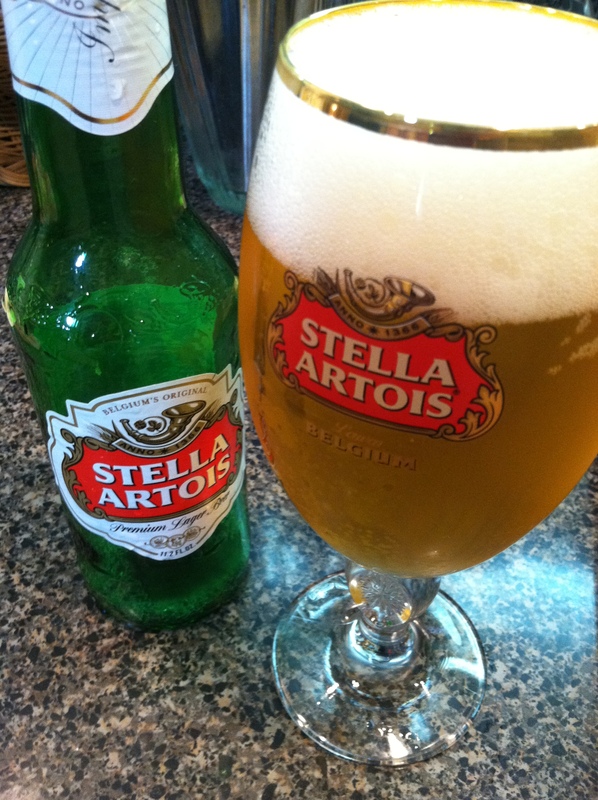 I drank champagne; Robert, Stella Artois. This is how we get to use up a weekend of playing in the kitchen. I don’t just write about recipes and food, we live it. Every day, every meal. I cook and create food every single day for as many meals as I can. Sounds like we would be fat porkers, but we aren’t. Eat responsibly is the key. Love and enjoy food but don’t overdo it. Robert loves the results. I must admit, it sure is fun to finish with all the cooking and writing and photography; go take a bath and fall asleep. The next day go down to the kitchen and enjoy all the tasty things there are to eat over the next couple of days. It leads to more posts, more food and photographs. Robert does not like his food photographed. So, I make a plate to shoot before we eat. Maybe that’s why he doesn’t like his food photographed, he wants to eat first. I try not to waste food by eating what is photographed. Sometimes it is necessary to dedicate a plate to the shoot. Others, the plate gets consumed as soon as the camera lights fade. This time of year is my favorite as there is so much produce, fruit, and flowers available to play with. I encourage you to try using arugula/rocket in a salad. 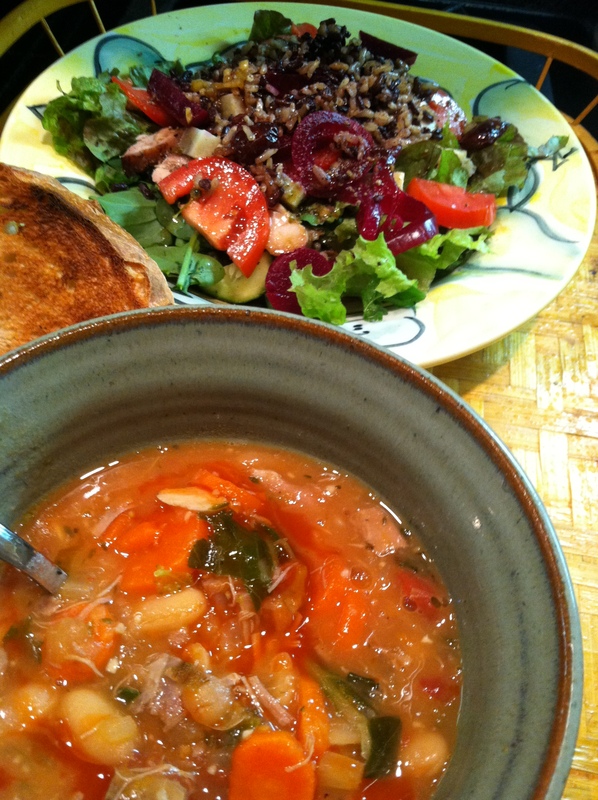 It is great to top a pizza or drop into soup. Use arugula/rocket just as you would spinach, raw and cooked. The home-grown varieties seem to have more peppery flavor than commercial products. Let me know how you like this crazy green. This entry was posted in Cooking Thoughts, Recipes, The Life of a Chef and tagged Arugula, Beet, herbs, Olive oil, Pickled Beets, rocket, salads, Stella Artois. Bookmark the permalink. Me too. My favorite salads include arugula and lots of vegetables. I adore the peppery flavor.